October 1905: Bishop McDonnell informs Father James J. Flood, a native of Ireland currently presiding at St. Agnes, Rockville Centre, that he has been selected to establish a new parish in Park Slope, Brooklyn. 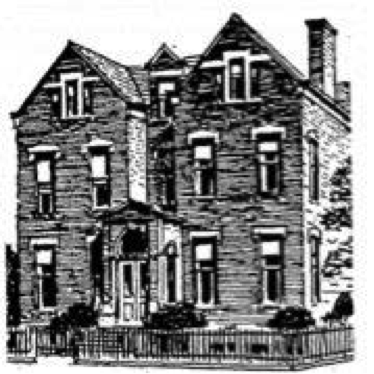 December 1905: Father Flood purchases the Eng Mansion, a red brick building on the corner of 8th Avenue and 7th Street, for $18,000 and converts it into a temporary chapel and rectory. Father Flood purchases the corner lot at 8th Avenue and 6th Street from the Turnbull family for $42,648. February 1906: Ground is broken for the lower church. Parish continues to flourish and, owing to the large number of children in the parish, the need for a school is becoming imperative. July 1908: Ground is broken for the 6th Street school. The site would become a four-story building with a capacity of 1,200 students, which was erected at a cost of $85,000. September 1909: School is opened with 124 pupils and taken charge by the School Sisters of Notre Dame with Sister Marty Petra as Superior. Over the years the school continues to grow and becomes overcrowded, especially with the addition of high school. April 1912: Cornerstone is laid for the upper church. The church we know today would be dedicated in late September 1918. May 1956: Ground is broken for the 7th Street school. Completed in 1957, the site would become the three-story building our Academy is housed in today. Over the years the elementary students are moved to the 7th Street school, and the 6th Street school becomes Saint Saviour High School, a college preparatory school for young women. September 2012: Saint Saviour Elementary School moves to an academy model governed by a Board of Directors and is renamed Saint Saviour Catholic Academy.